The tournament is a double round robin featuring four to six players. The tournament regulations use the Sofia Chess Rules and the football scoring system of 3-1-0. One of the venues for this tournament has always been the city of Bilbao in Spain. In year 2011 and 2012 a second venue was added as Sao Paulo in Brazil with one of the rounds in each place. The first edition of the grand slam was held in the year 2008. The playing place allowed a lot of people to follow the games live and directly. A huge soundproofed and air-conditioned glazed case was constructed for this purpose on the Plaza Nueva. This was used again in 2009. The winners of this prestigious event have been Magnus Carlsen (twice), Levon Aronian (twice), Veselin Topalov, Vladimir Kramnik, Viswanathan Anand and Wesley So. 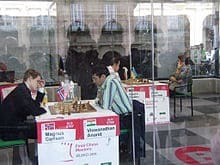 The 2008 tournament consisted of six players Viswanathan Anand, Magnus Carlsen, Vassily Ivanchuk, Veselin Topalov, Teimour Radjabov and Levon Aronian. Topalov dominated the tournament and won the event with 17 points (football scoring system). Anand finished last in the event but such a performance by him was possibly due to the fact that the chess world championship 2008 match between Anand and Vladimir Kramnik was only a couple of months away and one can speculate that he did not want to reveal his cards. The second edition of the tournament consisted of four players competing - Sergey Karjakin, the winner of 2009 Wijk ann Zee Corus Chess Tournament, Alexander Grischuk, winner of Ciudad de Linares Linares Chess Tournament, Alexei Shirov, winner in Sofia MTel Masters Chess Tournament, and Levon Aronian, second-place winner of Pearl Spring chess tournament since the winner Veselin Topalov refused the invitation to play the Final. Levon Aronian emerged as the clear winner, winning the event with one round to spare. The Third edition once again featured four players and took place in the Alhóndiga Bilbao. It was a category 22 tournament, the highest rated tournament in history. Two players were directly seeded to the final. They were Viswanathan Anand, the World Chess Champion, Magnus Carlsen the winner of that year's Bazna Kings, Corus as well as the Pearl Spring tournament. For the other two spots a qualifier tournament was held in Shanghai, China consisting of Vladimir Kramnik, Levon Aronian, Alexei Shirov and Wang Hao. Alexei Shirov and Vladimir Kramnik (by winning over Levon Aronian in tie-breaks) qualified for the final masters. Vladimir Kramnik then went on to win the final masters as well. In contrast to Grand Slam Masters Finals in the last years, the organizers decided to return to a six-player double round robin without a special qualification tournament. The first half of the fourth edition was played in São Paulo from September 25 to October 1, and the second in Bilbao from October 5 to October 11. The players invited to the Grand Slam Masters Final 2011 were World Chess Champion Viswanathan Anand, second at the Pearl Spring chess tournament and the Tata Steel Chess Tournament; Magnus Carlsen, the winner of Bazna Kings Tournament and the Pearl Spring chess tournament; Hikaru Nakamura, the winner of the Tata Steel Chess Tournament; and Levon Aronian, world number 3. The other already qualified players - Vladimir Kramnik, the winner of the 2010 edition, and Sergey Karjakin, second at the Bazna Kings Tournament - declined to play and were replaced by Vassily Ivanchuk and Francisco Vallejo Pons. Magnus Carlsen dominated the Bilbao half of the 4th Final Masters and finished level with Vassily Ivanchuk who played so well in the first half. Both were scoring 15 points (three points per win - Ivanchuk had the most wins of all players, Carlsen would have been clear first with a normal scoring system). Carlsen won the event after defeating Ivanchuk in a blitz playoff 1.5-0.5. The format was a six-player double round robin. The first half of the fifth edition was played in São Paulo from September 24 to September 29, and the second in Bilbao from October 8 to October 13. The sixth Grand Slam Chess Masters final was held on 7-12 October in Bilbao as a double round robin with four players. 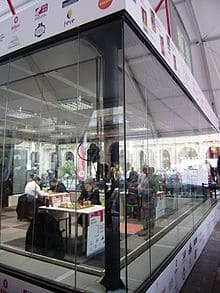 The seventh Grand Slam Chess Masters was held from 14-20 September in Bilbao as a double round robin with four players. Viswanathan Anand emerged as the winner. The eighth Masters tournament was held from 26 October to 1 November in Bilbao as a double round robin with four players. Wesley So won the tournament after beating Anish Giri in tiebreaks.